Polycom has unveiled new videoconferencing solutions designed to add a lifelike look and feel to virtual meeting experiences. These solutions are headlined by a new, immersive Telepresence experience and a new camera with advanced video production features. Among the new solutions is the Polycom Immersive Studio Flex, designed to bring the experience of the high-end Polycom Immersive RealPresence technology to more businesses at a more affordable price. The Immersive Studio Flex can be customized to individual spaces and budgets and offers Microsoft Skype for Business functionality at a 37 percent lower cost than other leading solutions, according to the company. 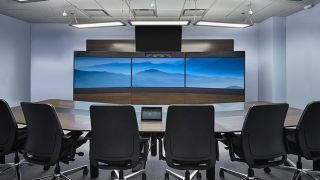 Like other Polycom Immersive solutions, the Immersive Studio Flex features an 18-foot video wall with three 4K UltraHD display screens. EagleEye Director II cameraFurther enhancing the meeting experience, the new Polycom EagleEye Director II camera is designed to provide the look of a professionally produced video meeting when combined with Polycom Group Series video room systems. Without the need to manually adjust or to use a remote, the camera automatically zooms in on and frames the active speaker from 32 feet in less than three seconds, panning out when the discussion includes more than one person. The camera runs on the new Polycom Group Series 6.1 release, the engine that drives Polycom’s voice and video technology. The RealPresence Immersive Studio Flex and EagleEye Director II, available in select countries starting this month, are the first solutions to be announced following the company’s acquisition by Siris Capital Group, LLC and transition to a private enterprise.